Lucy from Lulastic and the Hippy Shake has been reading Parenting for Social Change by Teresa Brett and snipping quotes for her Facebook page along the way. Here’s one that has stayed with me. I’m convinced this is helpful and would change how many of us feel when we are at our most frustrated with our kids and their behaviour. What do you think? A strategy I have encountered that is useful in visualizing this new way of being with children is to imagine that children are beloved adult visitors from another country who don’t know our customs or ways. How would we treat such a visitor? 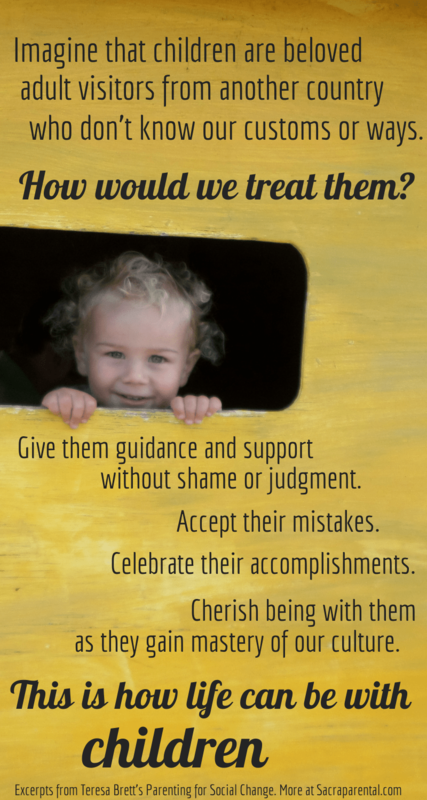 We would give them guidance and support without shame or judgment. We would accept their mistakes, celebrate their accomplishments with them, and cherish the experience of being with them as they explored and gained mastery of our culture. This is how life can be with children when we let go of our fears and control. Want more food for thought through your day? You can follow Lulastic’s excellent, busy Facebook page here, and Sacraparental’s here! Beautiful and inspiring. A must read to all parents.